Chief among them: the sports travel budget to send photographers and sports writers to away games, which will cost $8,000 this year (if we catch a break on NCAA tournament venues). Donors will get to listen live to the recording of special DTH Sports podcasts, starting with the football season preview at 8 p.m. Thursday. 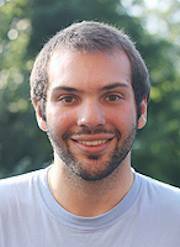 Today, former sports editor Michael Lananna ’14 writes about how DTH sports travel prepared him for his career as a sportswriter for Baseball America. Read Jonathan Jones’ post from last week. And then we’ll reminisce about the Riverwalk (it was beautiful) and the Tex-Mex (it was delicious) and the cowboy hats (I bought one), and we’ll joke about clear eyes and full hearts and not losing. Texas forever, right? That trip, which the three of us took together in March of 2014, is easily one of my favorite college memories, and I know Brooke and Chris would say the same. But make no mistake: It wasn’t a vacation. It wasn’t spring break. We had a job to do. And though we enjoyed ourselves, we also worked hard — very hard. At the time, Brooke and I were both senior sportswriters for The Daily Tar Heel, and Chris was photo editor. This was the trip we’d been waiting for. All of those years staring at computer screens in the DTH office, writing stories and cutlines, editing copy and photos, learning from editors and becoming editors ourselves — all of that was for this. The North Carolina men’s basketball team was in San Antonio for March Madness, and we were courtside, covering the games for the DTH. It was an opportunity we had worked for, dreamed about and earned. The trip ended in heartbreak for the Tar Heels, who surrendered a late lead to Iowa State and failed to advance to the Sweet Sixteen. Walking into the locker room afterward felt like walking into a funeral. I’ll never forget huddling around Marcus Paige’s locker with every other reporter and the discomfort of asking him questions while he fought back tears. As a young reporter, I hadn’t experienced anything quite like that before—that raw, unbridled emotion. I had to figure out how to process it. We all did. Looking back, I’m proud of the stories Brooke and I wrote from that night and the pictures Chris took. But more than anything, I’m grateful for that opportunity we had to learn and thrive on a grander stage, in a more intense environment. When I wrote for the DTH, I never wanted to feel like an actor playing the role of a sportswriter. I wanted to feel like a sportswriter. I wanted to be on top of the beats I covered—as plugged-in as any other reporter at any other outlet. I wanted to experience what they experienced. Sportswriters travel. It’s a necessity. More than ever, they need to have intimate knowledge of the teams and players they cover, to be able to bring readers inside the action. Straight, hard-news, AP-style game stories don’t move the needle anymore. Fans already know the score and the play-by-play and have seen highlights and GIFs hundreds of times before those game stories hit the wire. But those fans wouldn’t know that after UNC lost to Iowa State that night in 2014, assistant coach Hubert Davis was sitting in his coach’s office hunched over, with his head in his hands, sobbing. 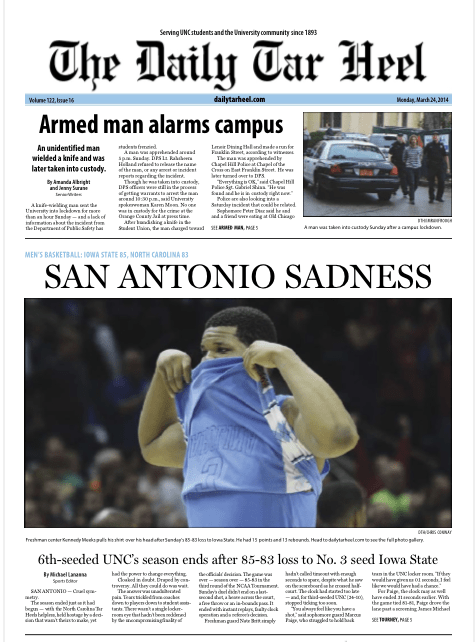 They wouldn’t know that San Antonio Spur Danny Green was in the Tar Heel locker room, comforting players, telling then-freshman point guard Nate Britt that the future was bright and he should keep his chin up. Those are the details that sell sports stories to readers, and they’re the details reporters only dig up when they’re present and engaged. I realize now how lucky I was to write for the DTH, to be able to travel to San Antonio for the NCAA tournament, South Bend, Ind., and Tallahassee for basketball games, Louisville and Columbia, S.C., for football games and a few other trips along the way. I’ve found that those experiences have come in handy now in the opening years of my professional career. Traveling to Omaha, Neb., in 2013 for the College World Series has helped me directly in my current role. I’ve been back to Omaha twice to cover the event for Baseball America, and there has been tremendous comfort in knowing what to expect. Traveling with the DTH prepared me in a logistical sense — figuring out how to get to places, who to talk to and where to go feels like half the battle in sportswriting sometimes. Traveling helped me connect with professional writers, to network with them and learn from how they went about things (and ocassionally join them out at San Antonio karaoke bars). Simply the experience of covering a team from the beginning of the season and carrying it through to that final postseason game has proven immensely valuable. I went from the UNC basketball beat at the DTH straight to the Los Angeles Dodgers beat with MLB.com the summer after I graduated. There’s no doubt that all of my DTH experiences of covering high-intensity games in unfamiliar places eased my transition to covering a playoff-caliber team on the other end of the country. I was only an intern, but thanks to the DTH, I felt like much more than that. Knowing how important and formative those DTH experiences were, it saddens me to hear that the paper is now in a financial quagmire. When I joined sports desk as a freshman in 2010, I joined with the promise that if I worked hard enough I would one day have the opportunity to follow the football and basketball teams on the road, travel to postseason games and the like. 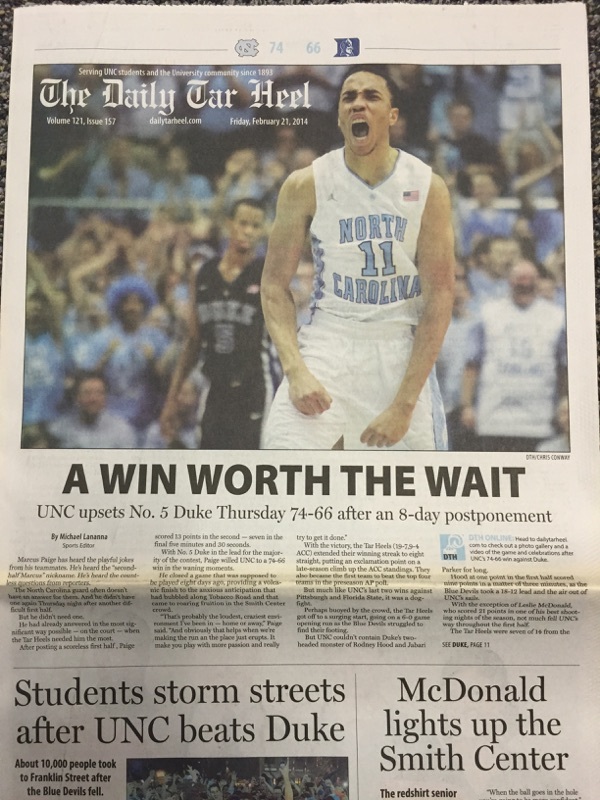 The DTH fulfilled that promise and more, and I’m so thankful. I hate to think that the young DTH sportswriters after me might not have those same crucial, skill-building opportunities. So let’s make sure that doesn’t happen. Join me in donating, and let’s help the DTH provide its sportswriters with the experiences they need to grow. Let’s give them their very own San Antonio. I know I’ll never forget mine. Read Mike’s archive of DTH stories here. Highlights include his time running the sports blog and that time UNC beat Duke after the eight-day snow delay.